The PAMP Suisse collection of bullion bars offers options in both gold and silver for sale. The series is unique for a silver bullion bar in that it has appeal for both collectors and investors. With .999 fine silver content, the bars are great for investing. The distinct designs issued for each year also make a great collectible addition. 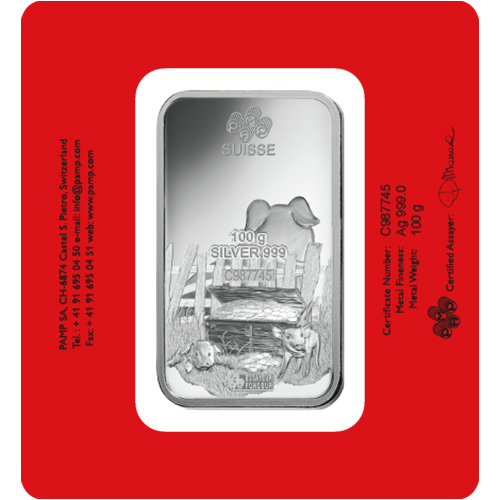 Today, 100 Gram Silver PAMP Suisse Lunar Pig Bars are available to you online at Silver.com. Available to ship inside of protective plastic package and sealed with an assay card! Produced for the 2019 Year of the Pig! Obverse design features an adult pig. Reverse design includes small piglets. The Year of the Pig falls last in the 12-year cycle of the Chinese lunar calendar. The final animal to arrive at the meeting at the Heavenly Gates called by the Jade Emperor, the pig is intelligent and mild-mannered. However, if you cross the pig you might live to regret it. Those born under the sign of the pig are said to be nice, good-mannered, and tasteful. 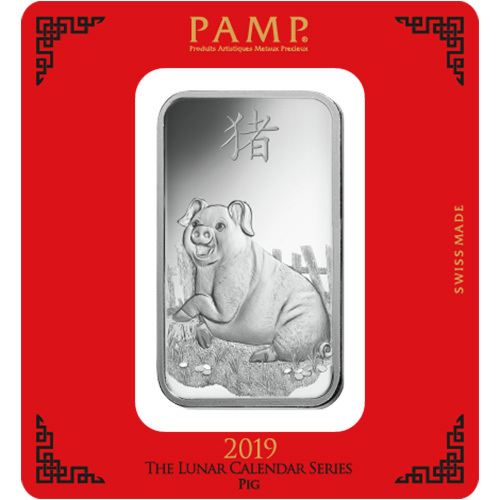 All 100 Gram Silver PAMP Suisse Lunar Pig Bars in this product listing are available to you with a protective plastic package sealed by a red assay card by PAMP Suisse. The use of red assay cards is not a coincidence in this series. During the celebration of Chinese New Year, it is common practice to give the gift of money inside red envelopes as a sign of fortune and good luck in the year to come. These bars include CertiPAMP packaging technology that allows you to verify your bar’s purity and metal content with PAMP Suisse. The Assay card includes the serial number, weight, purity, and metal content of the bar, along with the signature of a certified assayer. 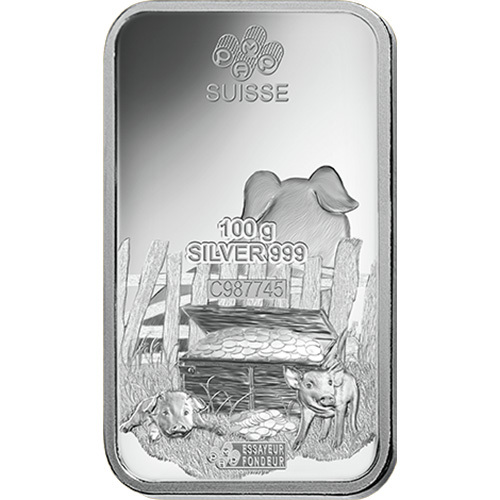 On the obverse side of all 100 Gram Silver PAMP Suisse Lunar Pig Bars is the image of an adult pig happily laying down in front of a humble wooden fence in a pile of grass with a few coins visible near its hooves. 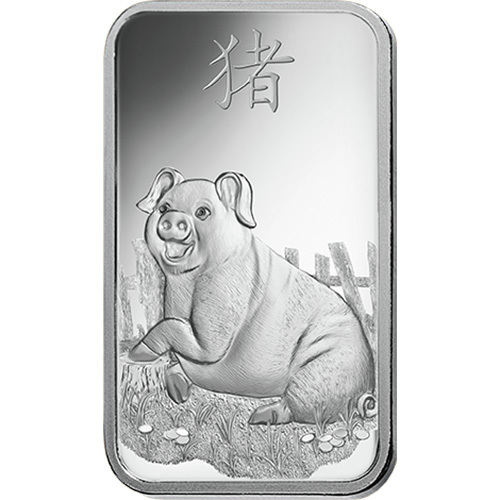 The reverse face of 100 Gram Silver Lunar Pig Bars includes the view of this same pig from the other side of the fence. This distinct viewpoint allows you to see the young piglets behind the fence near an open chest of coins. Please feel free to reach out to Silver.com if you have any questions. You can call us at 888-989-7223, chat with us live online, or email us directly.